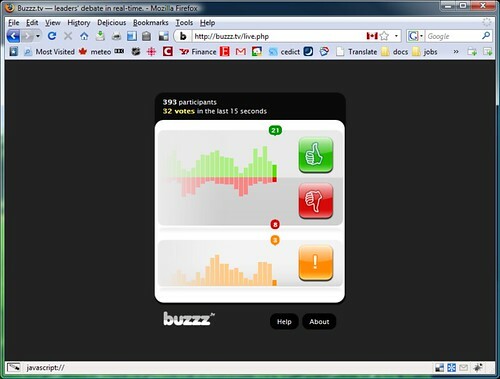 Hey, I finally get to use buzzz.tv on the Canadian party leaders' debate. Harper's getting gang-banged again. He sounds very patronizing by calling every other leader by their first name while they in turn keep calling him Mr. Harper. The host is nothing as good as Stéphan Bureau. This page contains a single entry by Cedric published on October 2, 2008 9:27 PM. Google Earth : Carte élections fédérales Canada 2008 / Federal Election Map was the previous entry in this blog. Future star candidates on the Radio-Canada archives site is the next entry in this blog.